Kumar A V R, P., S K, D., Beura, S., Reddy G R, S., Bhasker Goud G, U., M S, P. (2013). Comparative Evaluation of Effect of Extracting Solvents on Therapeutic Activities of Curcuma Aromatica Rhizomes. Iranian Journal of Pharmaceutical Sciences, 9(4), 83-97. Pranav Kumar A V R; Dr. Deepak S K; Susreekanth Beura; Sreenivas Reddy G R; Uday Bhasker Goud G; Potbhare M S. "Comparative Evaluation of Effect of Extracting Solvents on Therapeutic Activities of Curcuma Aromatica Rhizomes". 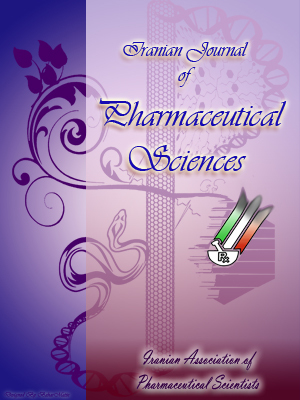 Iranian Journal of Pharmaceutical Sciences, 9, 4, 2013, 83-97. Kumar A V R, P., S K, D., Beura, S., Reddy G R, S., Bhasker Goud G, U., M S, P. (2013). 'Comparative Evaluation of Effect of Extracting Solvents on Therapeutic Activities of Curcuma Aromatica Rhizomes', Iranian Journal of Pharmaceutical Sciences, 9(4), pp. 83-97. Kumar A V R, P., S K, D., Beura, S., Reddy G R, S., Bhasker Goud G, U., M S, P. Comparative Evaluation of Effect of Extracting Solvents on Therapeutic Activities of Curcuma Aromatica Rhizomes. Iranian Journal of Pharmaceutical Sciences, 2013; 9(4): 83-97. There is the need for new drugs with better action and lesser side effects. A lot of research is being undertaken to find out new plant drugs, their extraction and pharmacological evaluation. One of such plant is Curcuma aromatica whichbelongs to the genus Curcuma and reported to have high ethno-botanical values in traditional medicine. The present study evaluates comparative pharmacological activity of four different extracts of Curcuma aromatica in healthy Wistar strain albino rats.Extraction of active constituents from powdered plant rhizomes was done by cold maceration technique using water, ethanol, hydroalcohol and toluene as solvents separately to get respective extracts. Acute oral toxicity study was performed to determine toxicity or side effects associated with the prepared plant extracts. The extracts were evaluated for anti-diabetic, anti-oxidant, anti-inflammatory and analgesic activity. Anti-diabetic activity was comparatively evaluated in alloxan induced diabetic rat models. Toluene extract was found to have relatively higher anti-diabetic activity. In vitro antioxidant potential of different extracts of was evaluated by DPPH radical scavenging activity. The results show anti-oxidant potency in toluene extract slightly better than other extracts. Aqueous extract of Curcuma aromatica rhizomes was found to have more potency in treatment of carrageenan induced paw oedema and also in its anti-nociceptive action against heat induced pain by Eddy’s hot plate method in rats.Though the anti-diabetic and anti-oxidant activities were slightly superior in toluene extract, the risk of residual amount of toluene remained in the final extract and its teratogenic property subdues its benefits of treatment.Findings of this research prove our hypothesis that oral administration of aqueous rhizome extract has potential anti-diabetic, anti-oxidant, anti-inflammatory and analgesic activities.